Arguing for a reconsideration of William Butler Yeats’s work in the light of contemporary studies of world literature, Barry Sheils shows how reading Yeats enables a fuller understanding of the relationship between the extensive map of world literary production and the intensities of poetic practice. Yeats’s appropriation of Japanese Noh theatre, his promotion of translations of Rabindranath Tagore and Shri Purohit SwÃ£mi, and his repeated ventures into American culture signalled his commitment to moving beyond Europe for his literary reference points. 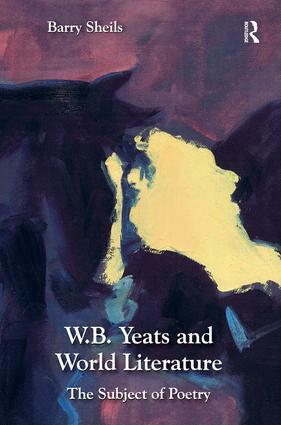 Sheils suggests that a reexamination of the transnational character of Yeats's work provides an opportunity to reflect critically on the cosmopolitan assumptions of world literature, as well as on the politics of modernist translation. Through a series of close and contextual readings, the book demonstrates how continuing global debates around the crises of economic liberalism and democracy, fanaticism, asymmetric violence, and bioethics were reflected in the poet's formal and linguistic concerns. Challenging orthodox readings of Yeats as a late-romantic nationalist, W.B. Yeats and World Literature: The Subject of Poetry makes a compelling case for reading Yeats’s work in the context of its global modernity. "Barry Sheils's book is a theoretically sophisticated and elegantly argued exploration of the tensions in the work of W. B. Yeats between a poetry focused on the nation and reliant on romanticism, and an embrace of modernity." Barry Sheils is an Irish Research Council Postdoctoral Fellow in the School of English, Drama and Film at University College Dublin.